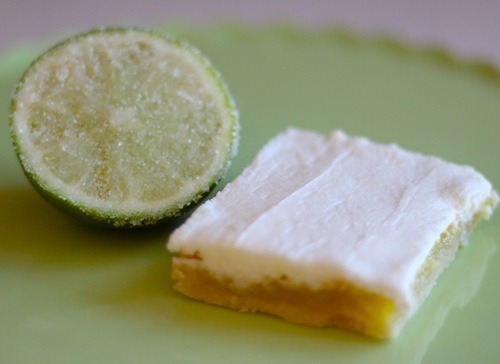 Lime bars or lemon bars for that matter are one of my favorite desserts. (if they are made right) Buttery, flaky, tart and sweet. Need I say more? Dough will be crumbly, not sticky. Press into a 9 inch square pan and into the oven for 15 min. Pour over warm crust and back into the oven for 20-25 minutes. Until slightly golden on top. As a sweet and creamy counterpart to all this zesty and tart goodness, I choose BUTTERCREAM! Lime/Vanilla Buttercream to be exact! Add the powdered sugar to the butter 1 cup at a time, mixing after each addition. Juice of 1-2 limes depending on spreading consistency. 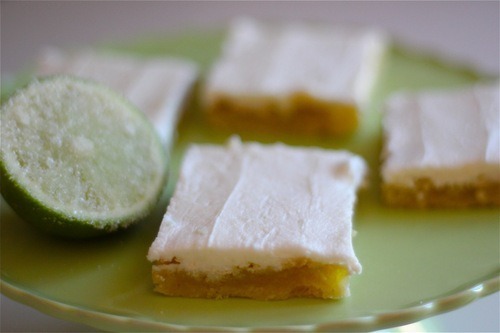 Spread over cooled lime bars, cut into squares and eat em up!